I spotted frozen Butterball turkeys at our supermarket and only the fact that my oven is just a glorified toaster kept me from hauling one home for Thanksgiving. Instead, as Mr. Noodle and I give thanks on this holiday for the many blessings in our lives, we'll recall with fond nostalgia the many enormous roasted poultry of bygone feasts. Of all appetite for the rest of the day. To explore off the turkey path. Thanks to my small oven and the paucity (and exorbitant price) of turkeys here in the Philippines, Mr. Noodle and I are not likely to enjoy a whole roasted turkey anytime soon. While this year is not the first time I've bypassed a big bird in favor of smaller poultry, it's a challenge to find new ways of preparing plain old chicken. So, when I came across a fabulous-sounding recipe featuring an unfamiliar spice blend called panch phoron*, I ripped it out of my sister's magazine and tucked it away for just such a Thanksgiving Day. 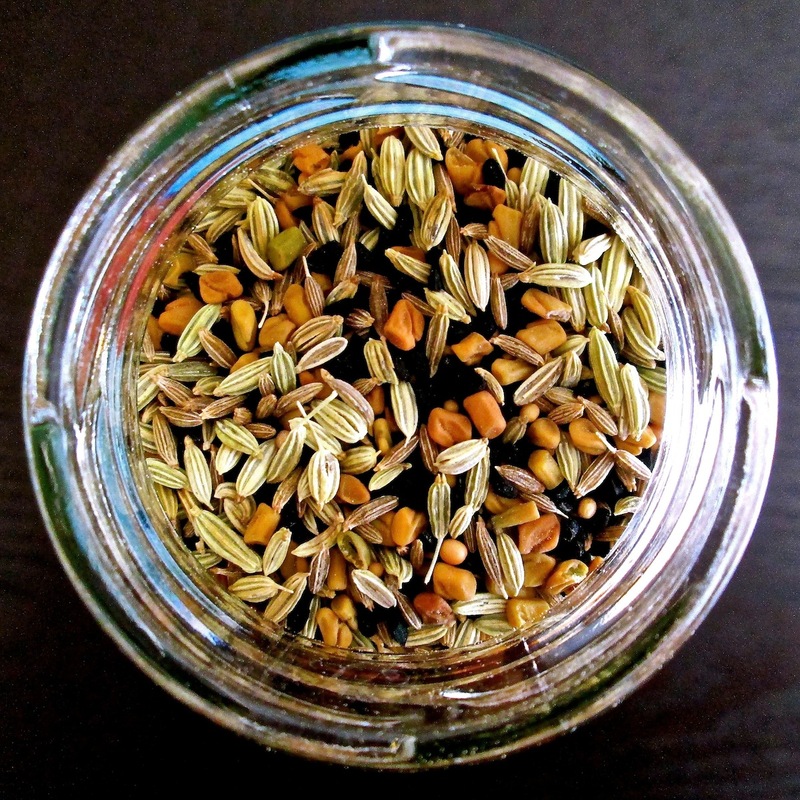 Also known as Bengali five-spice, this whole seed mixture of nigella, fenugreek, cumin, fennel and black mustard is most commonly used in Bangladeshi, Bengali and other Eastern Indian cuisines. Although it is available in ground form, panch phoron is best when the intact seeds are first fried in ghee (clarified butter) or cooking oil until they pop and release their distinct flavors, after which remaining ingredients are added. It is a versatile blend used not only on poultry, meat and fish, but also vegetables, lentils and bread. Bengali five-spice is readily available in Indian and South Asian markets, but it is also quite easy to make yourself. Simply combine equal parts of the aforementioned spices (be sure they are untoasted and whole) and store in an airtight container in a cool, dry spot. This dish had a surprisingly toasty, buttery flavor reminiscent of popcorn. It may be an odd descriptor but it was quite delicious. 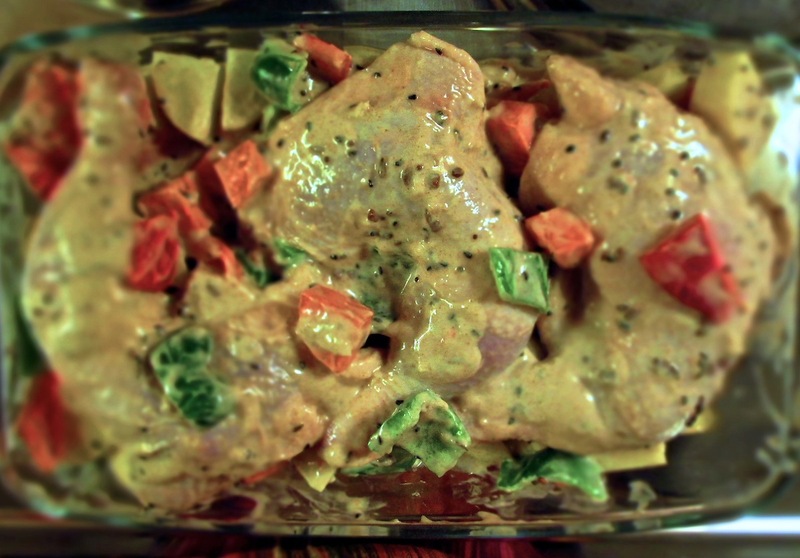 The yogurt marinade reduces to a nicely thick, mild-flavored sauce for the roasted potatoes and vegetables. Speaking of flavor, a comment left on the recipe page complained of the marinade's bitter taste, leading the user to abandon the recipe completely! Perhaps she should have had more faith in the instructions, which called for at least two hours (ideally overnight) of marinating. 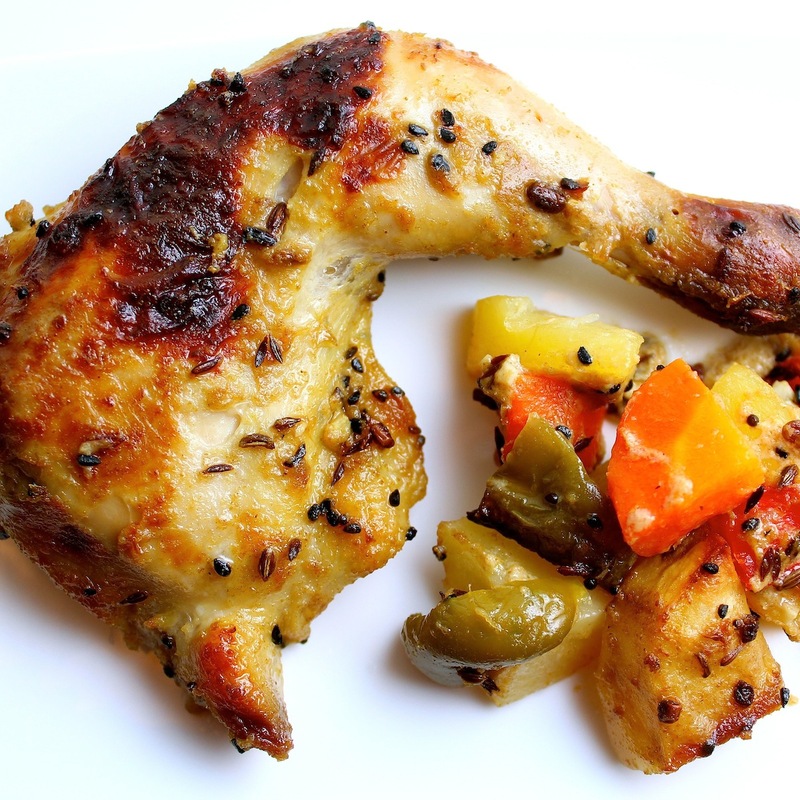 This allows the flavors of the spices and yogurt to blend and be absorbed by the chicken and vegetables. Roasting further gentles the taste, resulting in a mild flavor with a hint of sweet spice. My own deviation from the recipe came at the oven temperature and cooking time, and it was by fluke rather than deliberation. Mr. Noodle had an important Skype call that evening and I worried about setting off the too-sensitive [ahem] smoke detector. So, I lowered the temperature to 350˚F, even though I would have to cook it longer and forego a crisp, roasted texture. Even at this lower temperature, however, the chicken browned very quickly, necessitating a tinfoil blanket to keep it from burning entirely. Aside from that and an additional 15 to 20 minutes of cooking time, the dish came out as well as I hoped and received Mr. Noodle's enthusiastic approval. Fry panch phoron in a skillet or frying pan until seeds pop, then reduce heat and add bay leaves, ginger, garlic, coriander and salt. Sauté until fragrant, then remove from heat and let cool. Add yogurt and blend well; let marinade cool. In a large bow or sealable plastic bag, combine chicken, chopped peppers and carrots and cooled marinade, making sure to coat well. Refrigerate at least two hours or overnight. 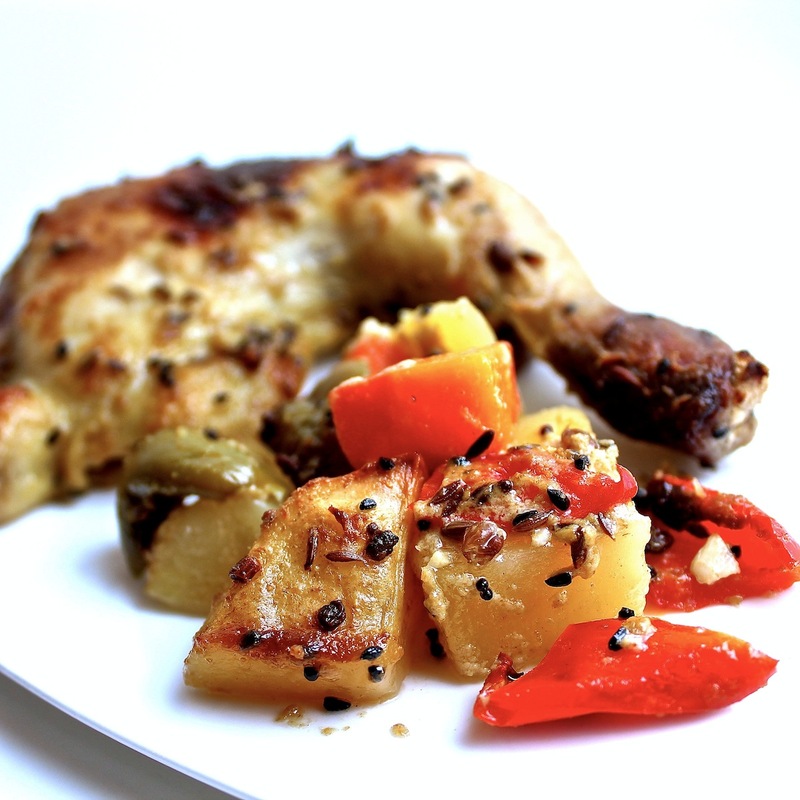 Layer a baking dish with potato chunks and arrange chicken mixture on top. Bake at 450˚F (see my note above) until chicken is cooked through, potatoes and other veg are tender and all are pleasantly browned. 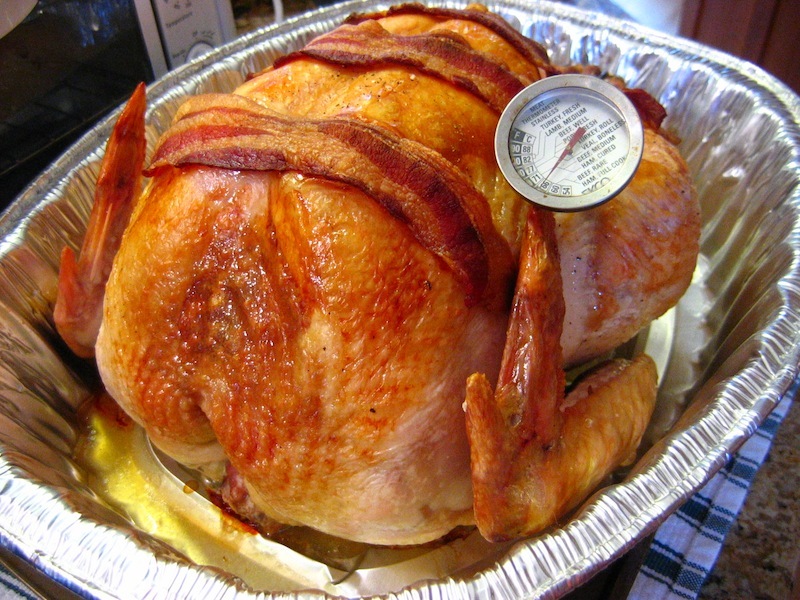 We just feasted on turkey this week, but your post made me hungry again! What a wonderful round up, too of different ways to do turkey. Thanks for sharing this, Tracey! I am thankful for your kindness and friendship. All the best to you & Mr. Noodle! I'm pretty positive I would love this recipe off the grill as well. We have a Big Green Egg, and my husband is having fun trying new recipes---just found one for him! Hope you are enjoying the Philipines! Hi Debi! Off the grill sounds fantastic and I would love to hear how it turns out if you throw this in the Big Green Egg. Since it's just the two and a half of us we hardly make turkey...I think we've only actually made it ourselves once! 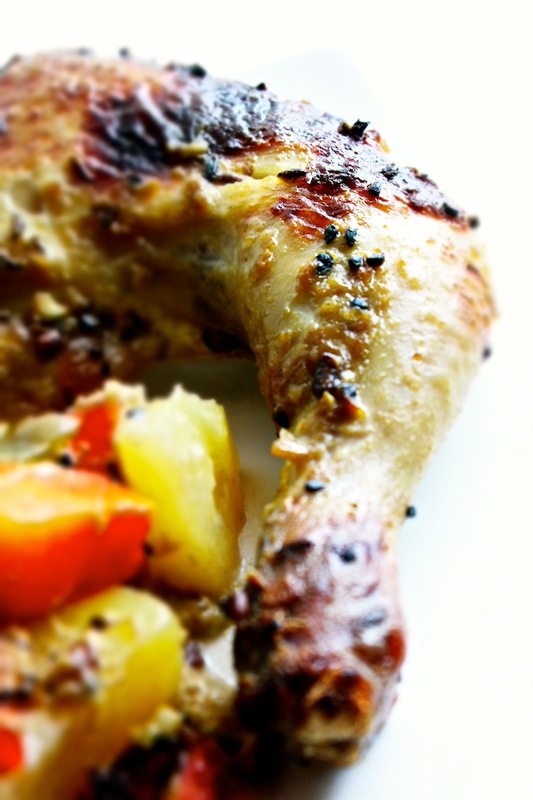 So we rely on different versions of roast chicken :) This one sounds like a keeper! Love the sound of that spice mix! Oh turkey of all forms cooked and mentioned in here your making me hungry. Must try out this one. :D Got my eye on your next posts.